We will be using the Interwoven Teamsite WebDesk Pro Templating features for creation of DCRs and generation of output pages. A DCR is created when a user inputs data into a DCT. A DCR is essentially an XML document containing data entered by the user. The DCR have tag <record> as the root tag containing a number of <item> tags. The data is present inside tag <value> which is nested inside tag <item>. Step 1: Launch Interwoven TeamSite templating and browse to your workarea. In the snapshot above, the workarea is Development_wa inside Developmet_branch. So as a first step we just browse to our Workarea ‘Development_wa’. This will list all the directories/files present inside Development_wa on the right side(as can be seen in the snapshot). Step 2: Select ‘New Data Record’ from the first menu bar from left. Step 3 : Select the category and data type for which you need to capture data. The following screen comes up which asks you to select a category and data type. One needs to just browse to the category directory and one will find all the data types listed for that directory. 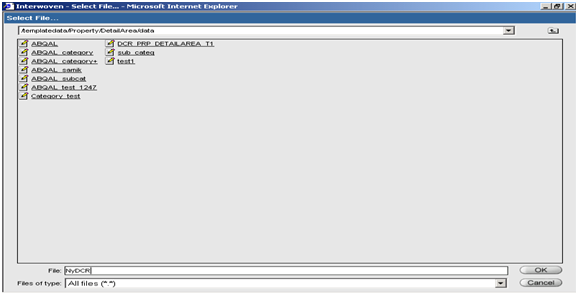 On selection of a data type the data capture form gets displayed to the user. Step 4 : Input some data into the data capture form. Step 5: Save the DCR by clicking the Save option. By default the DCR will get saved in data directory of the selected data type. Generating an Output Page from a Presentation Template in my Next Post. Interwoven TeamSite Templating provides an easy configurable way to capture, edit & store the data input by content contributors and define the look and feel of the captured data. The data capture process is separate and independent of the data presentation process, hence allowing unlimited usage of the captured data. The independent nature of the presentation process allows one to define different appearances for the same data depending on where and how the data is being used. 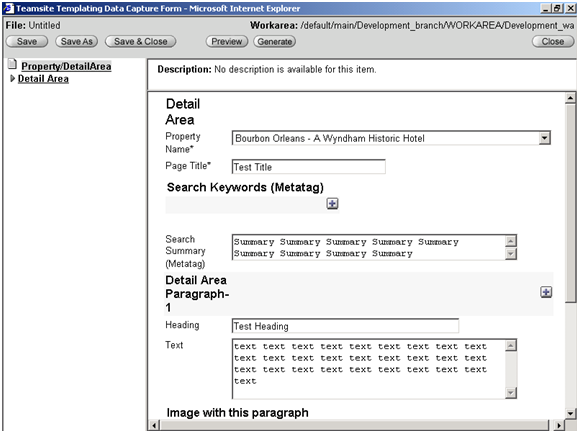 In TeamSite Templating the data is captured using a Data Capture Template(DCT). The data captured using a DCT is saved in an XML format in a file called as a Data ContentRecord(DCR). The DCR’s act as a source of data for Presentation Templates. A Presentation Template can use multiple DCR’s to generate a page(this page can be a JSP, ASP, XML, etc. as per the configuration defined). Before creation of a DCT and Presentation templates associated with the data type we define some configurations in templating.cfg. Following is a sample of file templating.cfg containing a single category News which has only a single data type sports_news. A template, Sports_Page_Template.tpl is defined under data type sports_news which will generate a file with extension .html . 1. There should be a directory named ‘templatedata’ inside your workarea. 2. Category ‘News’ will have a directory named ‘News’ representing the category inside directory ‘templatedata’ defined inside a branch. 3. Data type ‘sports_news’ will have a directory named ‘sports_news’ representing the data type inside directory ‘News’. 2. The definition of template is present inside tag . At least one tag should be present inside tag. 4. Tag is used to define the location of presentation template file. The Data Capture sub-system enables the user to work with forms which are created through a ‘Data Capture Template’ (DCT). 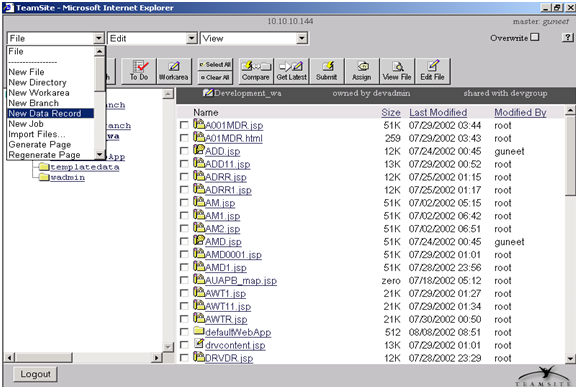 Once the user fills the required content in the DCT and saves it, a ‘Data Capture Record’ (DCR) is generated, which gets stored in the tool’s file system. This data is saved as an XML and is utilized to fill the ‘Presentation Template’ which governs the look of the final web page. This sub-system can be employed in a TeamSite Templating Browser or a java environment. o Deduce the input of the person entering the data. o Save the data entered in the required format. A ‘Data Capture Template’ (DCT) consists of an XML file named datacapture.cfg which specifies the form to be used to get the data content from its subscribers. These specify what type of data the DCT uses. The content entered in the DCT is saved as an XML on TeamSite. One DCT can be used to generate multiple DCRs. Once the DCR gets created after the data entry in the DCT, the page can be generated through the page generation sub-system reachable by the command line. This enables the user to view the required data in the required format. An output file can also be created that uses data from more than one DCRs and database queries. This output file may also be deployed to a web server using OpenDeploy. A ‘Presentation Template’ specifies how the data entered looks on the generated page. The data present in this template is obtained from the DCRs which was initially entered in the DCT. The TeamSite Templating can also be designed to fill the presentation template with selective information from a relational database. o Component templates – i.e., a component of another presentation template or a nested template. o A single DCR to fill multiple presentation templates, all having a different appearance and display. It uses an XML file with extension .tpl. decide the user should be able to view through the TeamSite GUI. o Use the DCR and presentation templates to generate the required results. A Data Content Record ‘DCR’ is XML file. It has the design information along with the data entered in the DCTs. The name of the DCR is user specific.